Happy Sunday! 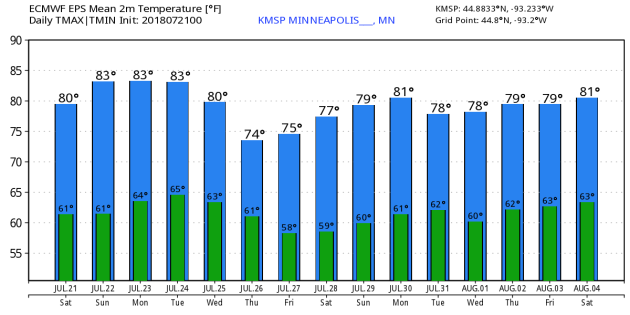 Our summer slide continues today as the average high in the Twin Cities begins falling from its warmest temp of 84F (July 6th - 21st) to 83F (July 22nd - August 3rd). As we head into August, the average high sees a more dramatic drop which goes from 83F on the 1st to 78F by the 31st. You may also be noticing later sunrises and/or earlier sunsets. In fact, the Twin Cities has lost nearly 35 minutes of daylight since the Summer Solstice on June 21st and we'll lose another 20 minutes of daylight by the end of the month. Get this, your soon-to-be Superbowl Champions, the Minnesota Vikings start full team practices NEXT SATURDAY!! Also, the Great Minnesota Get-Together is a little more than 4 weeks away - GASP! Hang on to those good summer vibes, it's slipping away fast! It has been an extremely wet July (for some) with some spots picking up nearly 6" to 10" of rain! Some of the heaviest has fallen across parts of Central and Southwestern Minnesota, which has been impacting farmers and even pheasant roosting numbers. The KMSP Aiport has seen 4.23" of rain so far this month, which is 1.66" above average! The 30-day precipitation departure from normal map suggests that many areas from the southwestern part of the state to areas across central and northern portions of the state are nearly 3.5" or more above average (in blue). 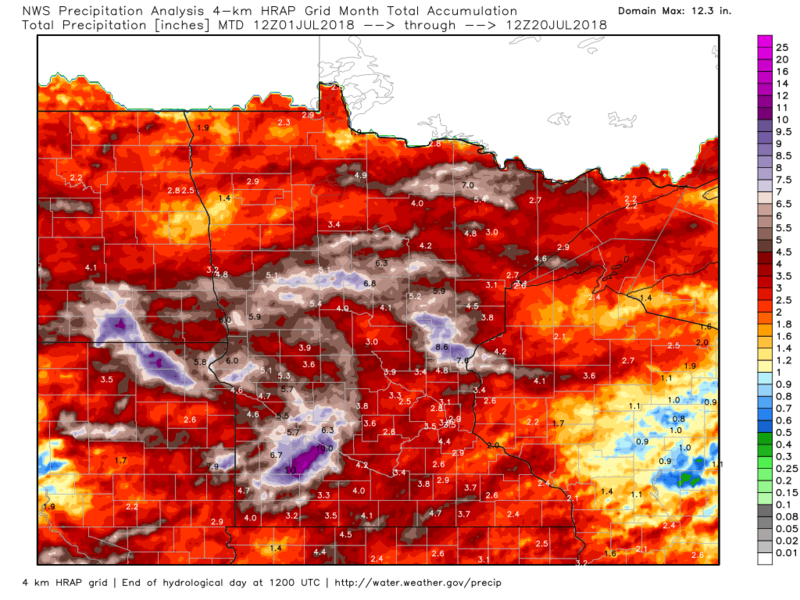 July certainly has been a wet month (for some), but for a few locations in far northwestern and east-central Minnesota, it has been a little drier than normal. 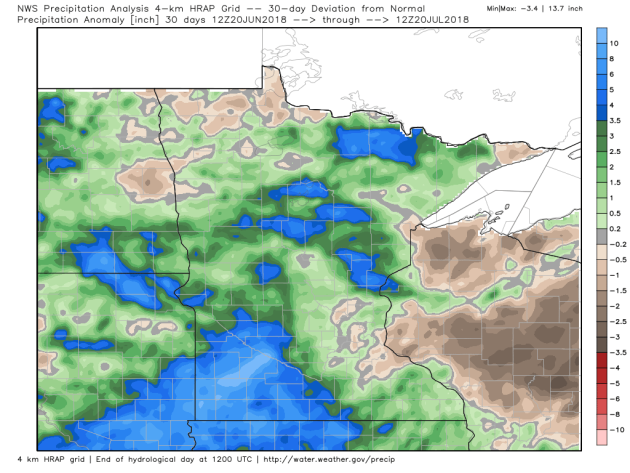 "Heavy rain, flooding another blow to Minnesota farmers"
"Low commodity prices, relentless rain taking toll. Heavy rain and flooding in southern Minnesota last week punctuated a troubling start to the growing season for corn and soybeans in the state. It’s been too wet, and crops are suffering. “It’s just been a fight all spring and now through the summer. It’s tough to get anything done,” said George Goblish, a farmer outside Vesta, Minn., 2 ½ hours west of the Twin Cities. “Right now I have between 200 and 300 acres under water. And then probably another 5 to 10 percent will be on the borders of the water, which will be short, unhealthy, prone to more disease.” The share of corn in Minnesota in good or excellent condition dropped from 90 percent on June 10 to 79 percent by July 8, according to the U.S. Department of Agriculture, and the share of soybeans in good or excellent condition dropped from 86 percent to 75 percent over the same period. For farmers, it’s an unwelcome development as they struggle to deal with low commodity prices and the start of a trade war with China that falls heavily on soybean farmers. 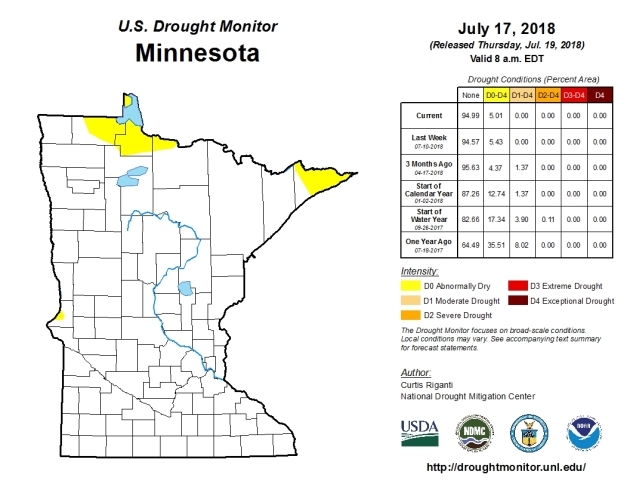 The most recent pressing problem has been too much rain, saturated soil and standing water in fields, followed by a 6- to 8-inch deluge on July 3. "Wet streak could adversely affect pheasants"
"WILLMAR, Minn. — A wetter-than-normal June and a wet start to July have many in the wildlife community concerned that pheasant nesting success will be adversely affected in the southern half of the state. There's only anecdotal evidence at this point, but the concerns are real in Kandiyohi County. Cory Netland, area wildlife manager with the Minnesota Department of Natural Resources, said he is among those who did not see many pheasant broods prior to the start of the wet spell. That suggests that nesting began in earnest as the rains fell, which would make the new hatchlings vulnerable. Kandiyohi County has not experienced the torrential downpours that have made the news in southwestern Minnesota, but it's been wet enough to cause problems for pheasant nesting, he said. Netland said last year's roadside count of pheasants, which is conducted in August, showed numbers were down in Kandiyohi County. After a relatively mild winter, many had expected numbers to rebound. Roadside counts in the past few years have showed pheasant numbers remain slow to rebound. One possibility for the slow rebound may be the trend toward wetter-than-normal weather during the nesting season, he pointed out." Thanks to bouts of heavy rain over the last couple of months, drought conditions across the state are nearly nonexistent. According to the US Drought Monitor, only 5% of the state is considered to be abnormally dry, mainly across the northern part of the state. Thanks to the National Weather Service out of Gray, Maine for sharing this picture below. You've heard of rainbows, but what about a fogbow? The process in which they form is the same as a rainbow, but due the size of the water droplets in the fog being much smaller than those in a raindrop, the colors in a fogbow tend to be much more muted. These fogbows are also sometimes called white rainbows. "The violent storm behind the duck boat tragedy was well-predicted, not ‘out of nowhere’"
"Seventeen people are dead after a severe thunderstorm capsized a duck boat in Branson, Mo., Thursday night. In the wake of the tragedy, Jim Pattison Jr. president of the parent company for Ride the Ducks Branson, said the storm “came out of nowhere.” This is simply not true. Meteorologists had been tracking the storm for hours, and their forecasts offered considerable lead time for the hazardous weather. “This indirect blaming of meteorologists was old a decade ago and is completely inappropriate in this particular situation,” wrote Mike Smith, a retired meteorologist and former executive at AccuWeather in a blog post. The National Weather Service issued a severe thunderstorm watch, signaling conditions were favorable for dangerous storms in the region, at 11:20 a.m. Central time, nearly eight hours before the storm struck. The watch cautioned “widespread damaging winds likely with isolated significant gusts to 75 mph possible.” As the storms drew close, the Weather Service issued a severe thunderstorm warning at 6:32 p.m. Central, indicating a violent storm was imminent, about 30 minutes before the boat capsized. “I’ve been so upset over how preventable this was,” tweeted Elis Raffa, the morning meteorologist for CBS affiliate KOLR in Springfield, Mo. “This is not 1901,” tweeted Marshall Shepherd, a past president of the American Meteorological Society, and professor at the University of Georgia. “We have satellites, advanced radars, good weather models, all short-term weather information showed that storms approaching well before the boat was on the water.” In a blog post, Shepherd even noted that the Weather Service had highlighted the risk of severe storms Wednesday, more than a day before the disaster. “Absolutely negligent to have put that boat in the water,” tweeted Brian Monahan, meteorologist for ABC affiliate WSB-TV out of Atlanta." 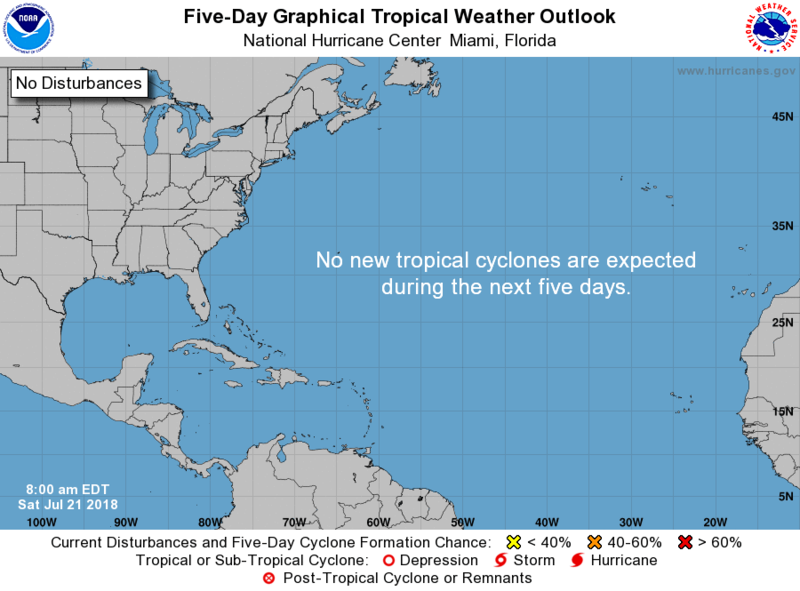 According to NOAA's National Hurricane Center, weather conditions in the Atlantic basin remain rather quiet with no tropical cyclones expected over the next 5 days. The Eastern Pacific is a little bit more interesting with a few waves of energy drifting west through the basin. 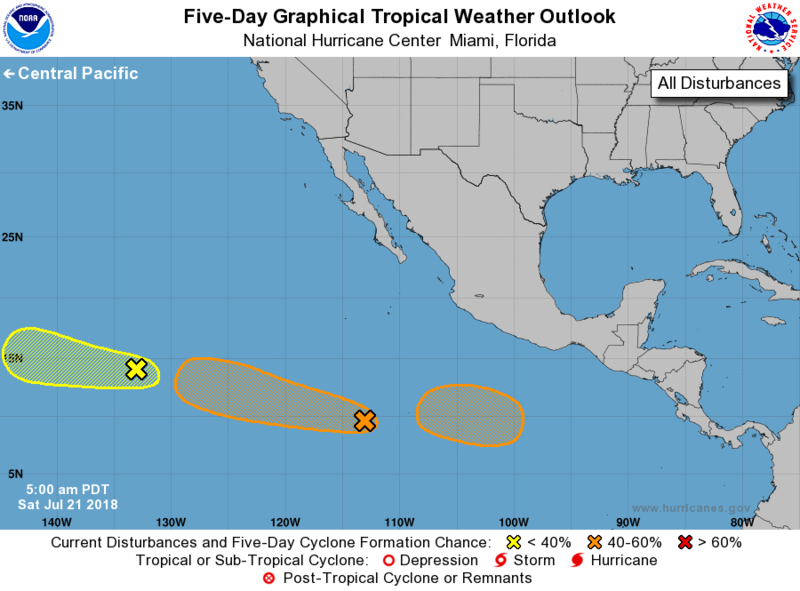 According to NOAA's NHC, these have medium and low chances of tropical formation over the next 5 days. This is neat map from NOAA's NHC, which shows where we typically see tropical cyclones develop in mid to late July. Note that in the Atlantic, we start seeing more activity in the Central Atlantic and near the Cape Verge Islands off the western tip of Africa. Thanks to the @NWSTwinCities for the image below, which shows what kind of weather we'll be up against through the week ahead. For those of you who aren't fans of the extreme heat and humidity, you're in luck! It appears that fairly comfortable summer weather will be with us through the last full week of July. The week also appears to be fairly dry with only a slight chance of t-storms on Monday and Wednesday! Here's the weather outlook from AM Sunday to AM Tuesday. Weather conditions look to remain quiet on Sunday with comfortable temps and humidity values and more sunshine. 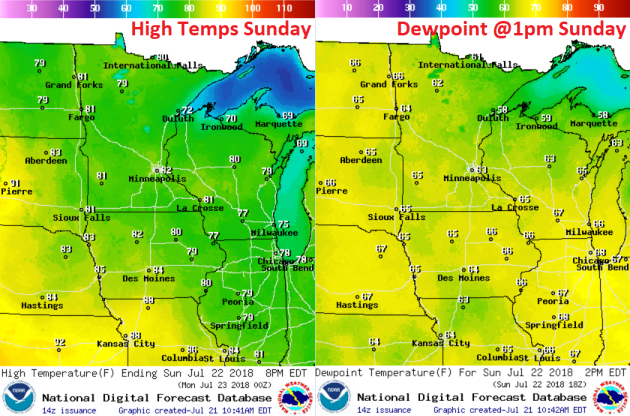 A wave of energy will approach the Upper Midwest late Sunday and into Monday with a few showers and thunderstorms, but should be rather isolated and tame across Minnesota once it reaches us on Monday. Here's the rainfall potential through AM Tuesday, which suggests a few pockets of rain across parts of the state as our next system rolls through the region. At this point, it appears the best potential of any accumulations will be across the northern half of the state and especially closer to the Red River Valley in northwestern Minnesota. 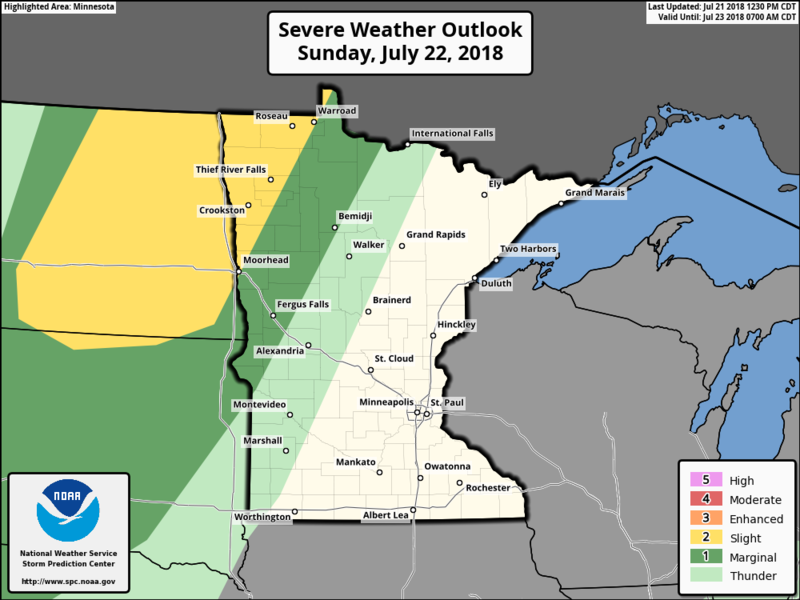 According to NOAA's SPC, there is a SLIGHT RISK of severe storms across the eastern portions of North and South Dakota as well as far northwestern Minnesota on Sunday afternoon and evening. While the some of the storms could be strong to severe there, they look to diminish as the head east into Minnesota early Monday morning. 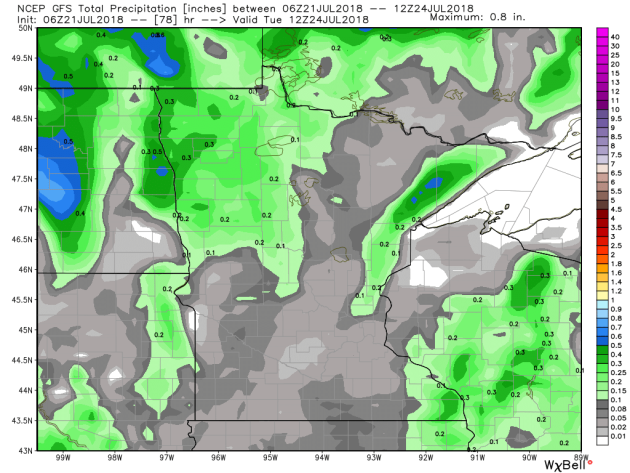 As has been the case for much of the summer so far, the strength and instability of this next system looks to dimish quite a bit once it reaches Minnesota. 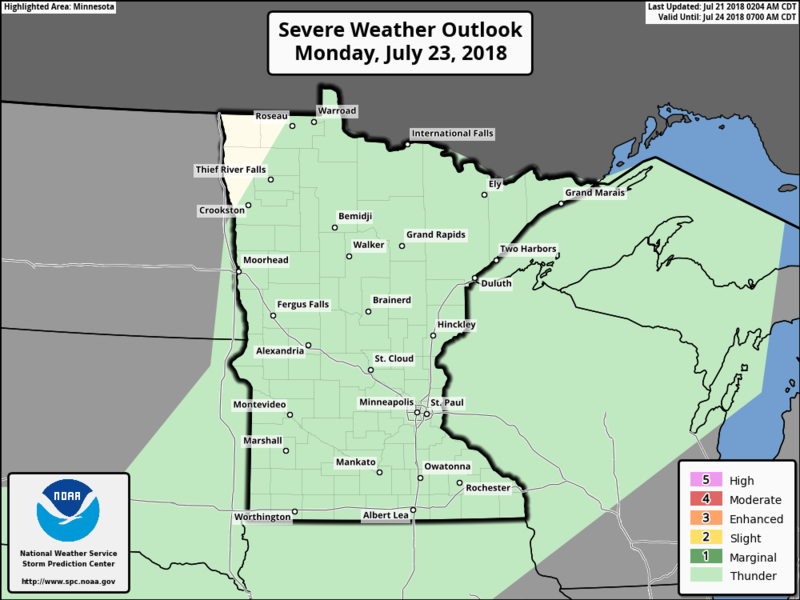 According to NOAA's SPC, there is just a general thunderstorm risk across Minnesota and Wisconsin on Monday. The extended forecast through the end of July and into the early part of August suggests fairly comfortable weahter contuing with highs in the Upper 70s and lower 80s. The ECMWF doesn't even suggest any big heat spikes returning anytime soon. However, I suspect we'll still have some type of heat to deal with, especially around State Fair time... we always do! Did you know that lightning ranks as one of the top weather related killers in the U.S.? 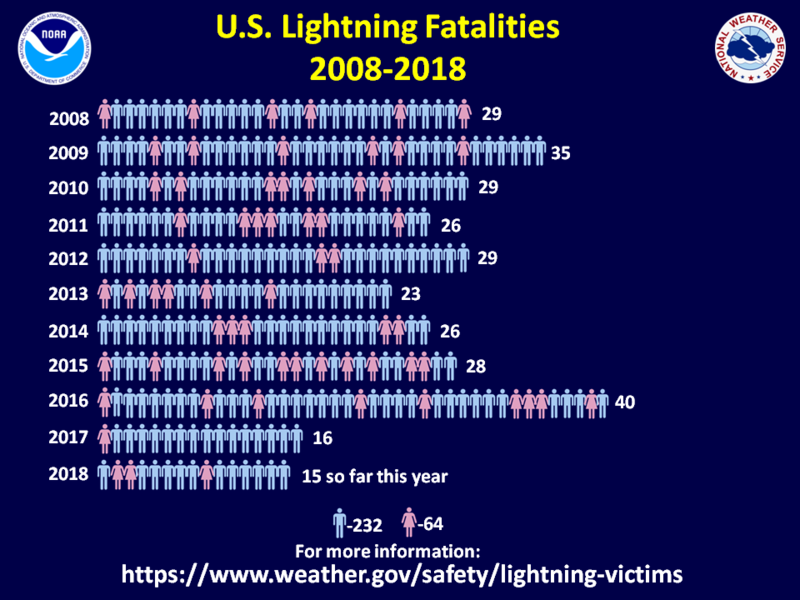 An average of nearly 50 people are killed each year in the United States and so far this year, 15 people have died from lightning; 12 have been males and only 3 have been females. Interestingly, from 2008-2017, 232 males have died, while only 64 females have died. 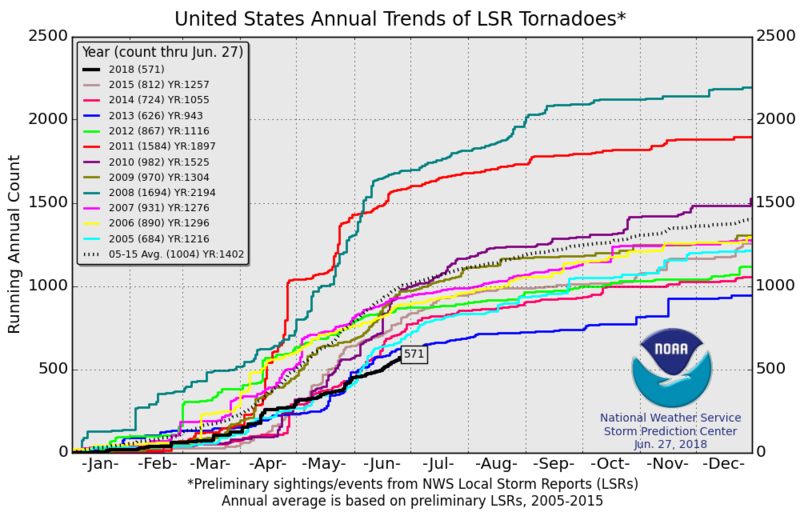 According to NOAA's SPC, there have been ONLY 571 preliminary tornadoes so far this year (through June 27th), which is quite a bit less than what we had at this time over the last several years. 2018, no question, has been a very quiet year in the national tornado department. Interestingly, there were 1,432 tornadoes at this time in 2011; that year ended with 1,897 tornadoes, which is nearly 500 more than the short-term 2005-2015 average. 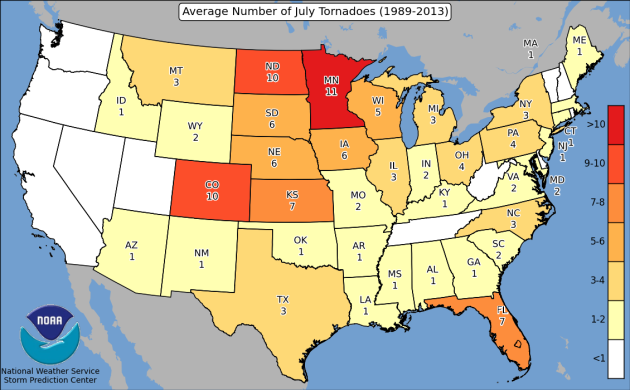 Here's the average number of tornadoes during the month of July by state. Minnesota sees the most with 11, but interestingly, Minnesota see averages 15 tornadoes during the month of June, which is the most out of any other month during the year. Comparitively, Minnesota averages 5 tornadoes in August, so we are still in our typical severe weather season here over the several weeks. 1.) 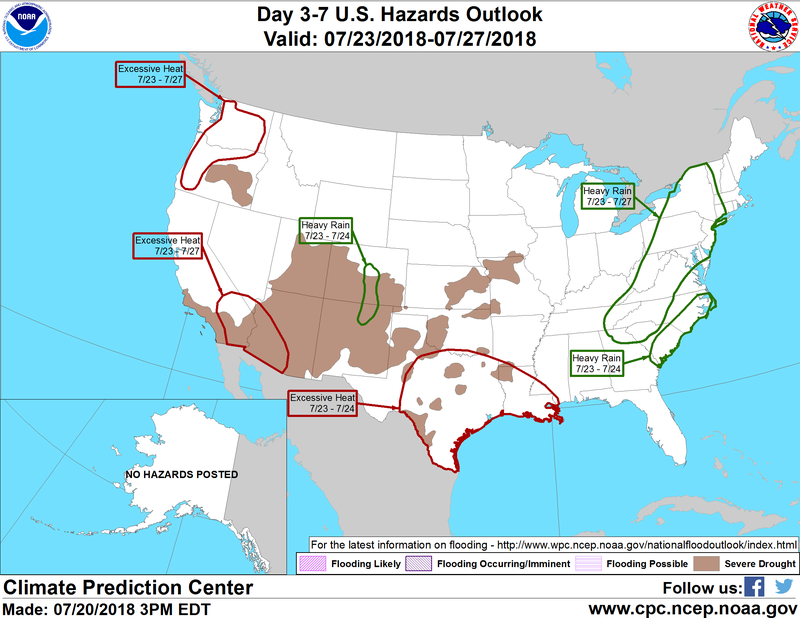 Heavy rain across portions of the Central Plains, the Central Rockies, the Southern Rockies, the Mid-Atlantic, the Southeast, and the Southern Plains, Mon-Tue, Jul 23-Jul 24. 2.) Heavy rain across portions of the Northeast, the Central Appalachians, the Tennessee Valley, the Mid-Atlantic, the Southern Appalachians, the Southeast, the Great Lakes, and the Ohio Valley, Mon-Fri, Jul 23-Jul 27. 3.) Excessive heat across portions of California, the Pacific Northwest, the Northern Great Basin, and the Southwest, Mon-Fri, Jul 23-Jul 27. 4.) Excessive heat across portions of the Lower Mississippi Valley and the Southern Plains, Mon-Tue, Jul 23-Jul 24. 5.) Slight risk of heavy precipitation for portions of the Central Plains, the Middle Mississippi Valley, the Lower Mississippi Valley, and the Southern Plains, Sat-Sun, Jul 28-Jul 29. 6.) Slight risk of heavy precipitation for portions of the Northeast, the Central Appalachians, the Tennessee Valley, the Mid-Atlantic, the Southern Appalachians, the Southeast, the Great Lakes, and the Ohio Valley, Sun-Tue, Jul 29-Jul 31. 7.) Slight risk of excessive heat for portions of the Lower Mississippi Valley, the Central Great Basin, the Southern Plains, the Northern Great Basin, the Southern Rockies, California, the Pacific Northwest, and the Southwest, Sat-Mon, Jul 28-Jul 30. 8.) Severe Drought across the Central Plains, the Central Rockies, the Lower Mississippi Valley, the Central Great Basin, the Southern Plains, the Northern Great Basin, the Southern Rockies, the Middle Mississippi Valley, California, the Pacific Northwest, and the Southwest. Here's a look at the weather in Dallas, TX over through the first 20 days of the month. 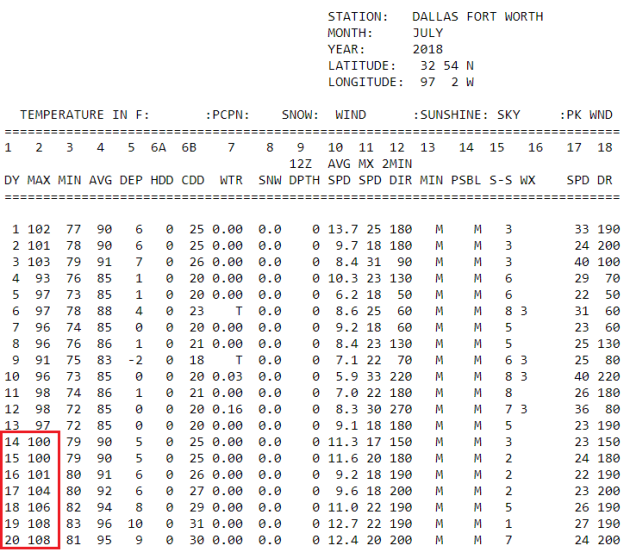 Note that since the 14th of July, Dallas has seen highs in the 100F+ !! It was extremely hot on the 19th & 20th when the mercury reached 108F both days! It hasn't been that hot since August 9th, 2012... WOW!! Excessive heat warnings continue around the Dallas/Fort Worth area through the weekend with actual air temperatures heatin up into the 105F to 112F range - YIKES!! 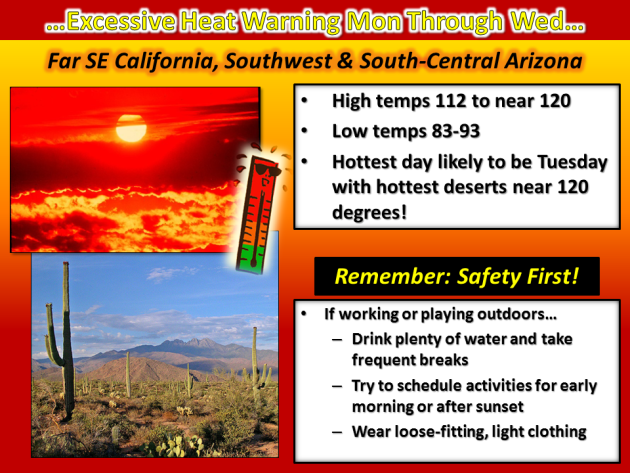 Excessive Heat in the Southwest Too! 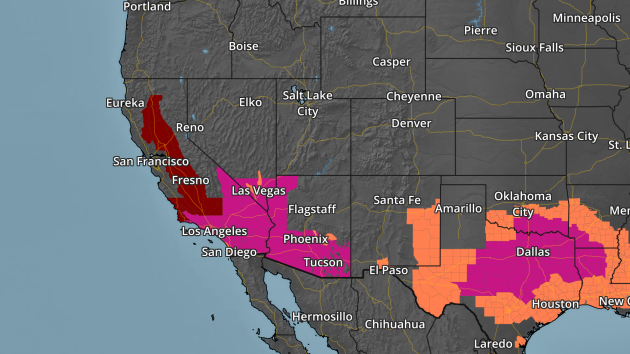 A number of excessive heat waches, warnings and advisories continues in the Southwest through next week as well. High temperatures will be well into the 100s for a number of locations for several days. Here's the weather story from the NWS out of Phoenix, AZ, which suggests that high temps will range from 112F to 120F across much of the region. In fact, some locations in the desert could see highs exceeding 120F - WOW!! 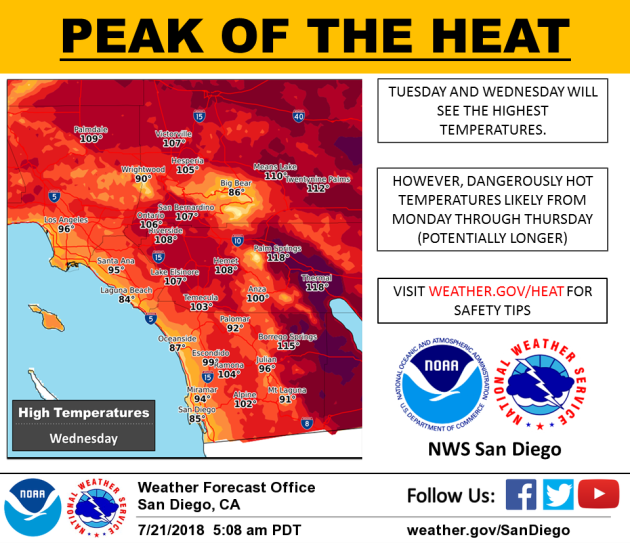 Here's the weather story out of San Diego, CA, which suggests that peak of the heat will be Tuesday and Wednesday with inland temps reaching 100F to nearly 120F! Also note that folks along the coast will be quite hot as well with highs in the 90s, including Los Angeles! 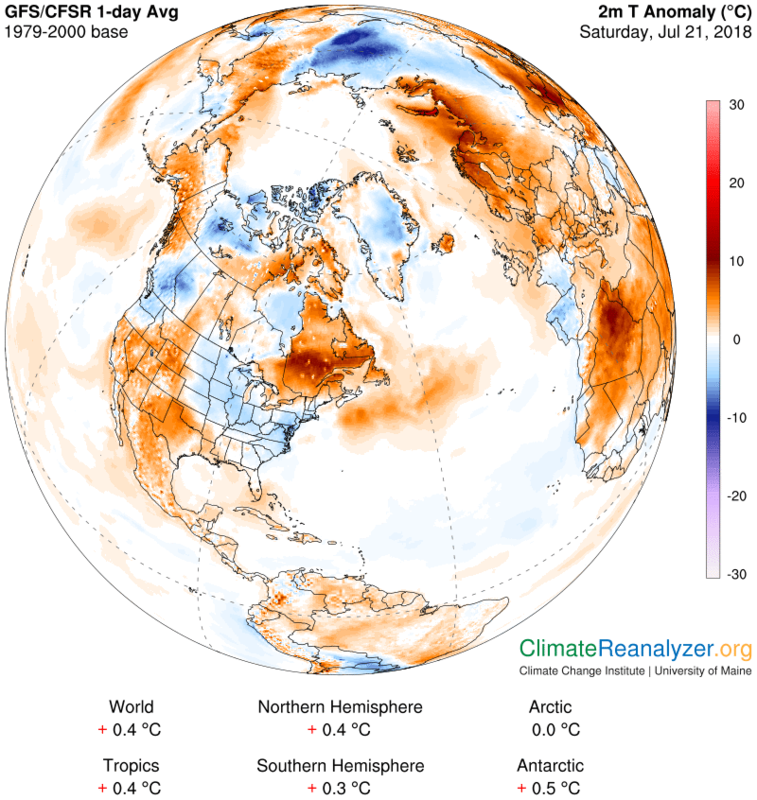 The temperature anomaly across North America on Saturday showed temperatures well above average across the Southern and Southwestern US. Some of the heat extended north into the Central and Northern Rockies/High Plains. Much of the Midwest, Ohio Valley, Northeast and Mid-Atlantic Region saw cooler than average temps. Here's the temperature anomaly as we head into the 4th week of July. Note the blue colors or cooler than average temperatures will continue to funnel south out of Canada into the Central US. These cooler than average temperatures will be fairly comfortable weather across those areas. Meanwhile, intense heat continues in the Southern and Southwestern US with highs well into the 100s. Note that some cooler air arrives for folks in the Central and Southern US as we head into the early/middle part of next week. The weather loop below shows active weather continuing in the Eastern US as our slow moving storm system continues to move east. Strong to severe storms can't be ruled out across parts of the Southeast on Sunday, but areas of heavy rain could continue across much of the East Coast through the early part of next week. According to NOAA's WPC, the 7-day precipitation outlook suggests areas of heavy rain across the Eastern US with several inches of rain possible through the last full week of July. There also appears to be another blob of heavier rain across the Central US from near Kansas City, MO to the Front Range of the Rockies near Denver and Colorado Springs, CO. Here is the national drought map from July 17th, which shows extreme and exceptional drought conditions across much of the Four-Corners region and for a few areas in the Central and Southern Plains. The good news is that the Monsoon season continues in the Southwest, so some locations should start to see improvement there. "The sun tires of summer and sighs itself into autumn" wrote Terri Guillemets. Have you noticed that summers go by faster the older we get? The years are a blur; with any luck you wind up with more good memories than bad. There's news of a welcome drought: only 6 tornadoes so far in Minnesota this year, according to NOAA SPC. For much of summer it's been too hot aloft; wind fields not ripe for the "shear" that can spin up tornadic "supercells". It's a relief not hearing sirens going off every other day. While the southern half of the USA sizzles, Minnesota enjoys a parade of cooler fronts puffing out of Canada - keeping temperatures comfortable into at least the first few days of August. By late next week it will feel like mid-September, with highs in the 70s and lows in the 50s. With hundred-degree heat suffocating much of the south I take nothing for granted. No more slow-moving storms like the one that just dumped over 4 inches of rain on Chokio and Lake Lillian. Just a quick T-shower Monday; again Wednesday - as the first hint of fall arrives on a fresh, northwest breeze. SUNDAY: Warm sun. No complaints. Winds: NE 7-12. High: 83. SUNDAY NIGHT: Partly cloudy and quiet. Winds: NE 5. Low: 67. MONDAY: Some sun. Risk of a brief T-shower. Winds: W 7-12. High: 82. TUESDAY: Plenty of warm sunshine. Winds: NW 7-12. Wake-up: 65. High: 84. WEDNESDAY: Few showers. Possible T-storms. Winds: NW 10-15. Wake-up: 66. High: 81. THURSDAY: More clouds than sun. Cool wind. Winds: NW 15-25. Wake-up: 61. High: 77. FRIDAY: Partly sunny. Still quite breezy. Winds: NW 10-15. Wake-up: 59. High: 76. SATURDAY: Sunny spells. Less wind. Winds: W 5-10. Wake-up: 58. High: 79. Sunday looks like a pretty comfortable day across the region with temps near or slightly below average. Dewpoints won't be too muggy, but a few locations in far western or southern MN could see slightly more sticky readings in the mid/upper 60s. According to NOAA's CPC, July 28th - August 3rd will be cooler than average from the Midwest to the Ohio and Tennessee Valley, while folks in the Southern and Western US will stay above average. "A Single Sock Could Be the Key to a Good Night’s Sleep During a Summer Heatwave"
"It’s a proven fact that a low body temperature is the key to a good night’s sleep. 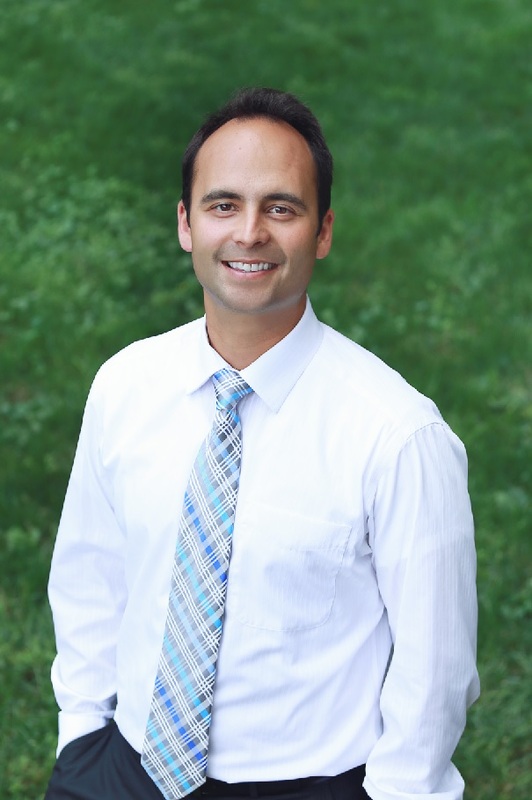 In fact, research has shown that we get the best sleep when a room is between 60 to 67 degrees Fahrenheit—which can be hard to come by in the summertime, no matter how hard your poor air conditioner is working. So, you can imagine how surprised we were to learn that the answer to a good night’s sleep, even in the midst of a heatwave, could come in the form of an extra piece of clothing. Now, before you get too worked up, don’t worry: we’re not about to suggest putting any additional items on your body. We’re not crazy! But we’d by lying if we said that a brilliant tip from Apartment Therapy didn’t have us rummaging through our sock drawer." "‘416,’ ‘Witch,’ ‘Not Creative’: How Fires Get Their Names"
"Already this year, the Ute Park and the Spring Creek Fires have become synonymous with ashen skies and widespread destruction. But hidden in their names is a clue about each: their place of origin. Unlike hurricanes, wildfires are not named from a predetermined list. They are named by officials, who choose names based on “a geographical location, local landmark, street, lake, mountain, peak, etc.,” the California Department of Forestry and Fire Protection said. Why name a fire? Officials said that quickly coming up with a label provides firefighters another way to locate the blaze and allows officials to track and prioritize incidents by name. A Twitter hashtag that identified the devastating fires in San Diego in 2007 — #sandiegofire — proved useful as people used it to organize information about road closures and evacuations, officials said. In most cases, the dispatch center sending the initial resources to a wildfire gets to name it, but sometimes that task falls to the first fire personnel on the scene, officials said. What they name it — well, that is up to them." "An "Asteroid" Discovered Last Year Just Turned Out to Be Something Way Cooler"
"An asteroid discovered orbiting the Sun in December last year has revealed a fun surprise: it's not one asteroid, but two, locked in their own binary orbit around a mutual centre of gravity. The object is called 2017 YE5 (as in "YE5 a surprise second asteroid, hooray! ")*, and when it was first detected on 21 December 2017, it was angled in such a way that astronomers couldn't tell whether it was two objects, or two lobes of the same object joined by a slender waist - like Comet 67P. But in late June, the asteroids were coming in on the closest point to Earth in their elliptical path around the Sun - a distance of about 6 million kilometres (3.7 million miles) from Earth; it was an observation opportunity too good to pass up. So between June 21 and June 26, scientists at Arecibo Observatory in Puerto Rico and the Green Bank Observatory in West Virginia teamed up for some astronomy magic. Arecibo transmitted a radar signal to the asteroid, which bounced off the object to be received by Green Bank in a technique called bistatic radar. Both observatories also observed 2017 YE5 independently, determining the gap between the objects. The two asteroids perform one full orbit of each other every 20 to 24 hours or so." "What happens when Lake Superior has too much water? It dumps it into an already overflowing Lake Michigan"
"For nearly a century, a dam at the head of the St. Marys River near Sault Ste. Marie, Mich., has been used like a faucet, controlling the amount of water flowing from Lake Superior into lakes Michigan and Huron. In the past five years, following a swift rise in lake levels, the relatively obscure Lake Superior board that regulates the amount of water released has stepped up these discharges, raising an outcry from a group representing property owners along the shoreline of Lake Michigan and potentially harming seasonal tourism. John Ehret, an Olympia Fields, Ill., resident and a director of the Great Lakes Coalition for Shoreline Preservation, occasionally shows people photos of the broad sandy beaches that once existed outside his cabin in western Michigan. Now, Ehert said, many of his neighbors have fortified their home with boulders, and his property is “damn near in the water.” Several factors have contributed to rising water levels and shoreline erosion, including increased precipitation and runoff, but Lake Superior outflow is exacerbating the problem, data from the National Ocean Atmospheric Administration and the International Lake Superior Board of Control show. Last year, the amount of water released from Lake Superior into lakes Michigan and Huron was the highest in 32 years." "Amid new hurricane season, Maria still taking a toll on Puerto Rico’s elderly"
"As Puerto Rico enters another hurricane season, the island’s elderly residents find themselves especially vulnerable. A recent study found some 4,600 Puerto Ricans perished in the months following Hurricane Maria--including many who died because of delayed medical care. Special correspondent Sarah Varney reveals just how precarious daily life has become for the island's elderly."